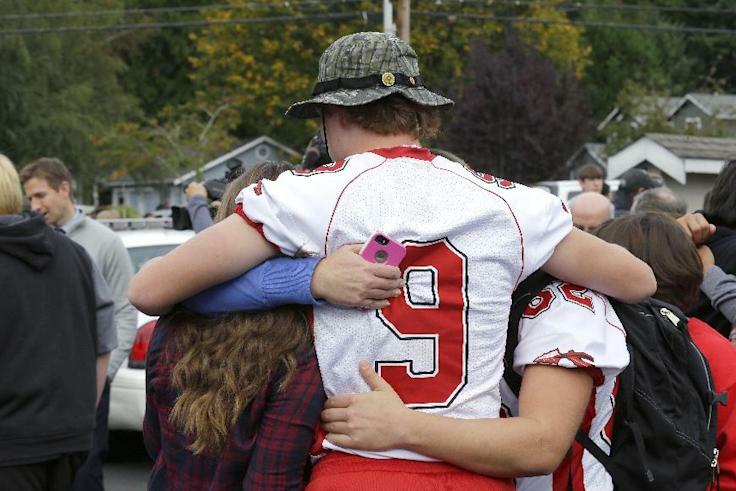 Students comfort each other following a shooting at Marysville-Pilchuck High School in Washington. (AP/Ted S. Warren) CLICK for slideshow on Washington State school shooting. Social media posts penned by the shooter in Friday’s rampage at a Washington State high school portray a head-over-heels teenager who grew more and more tormented when the relationship fell apart. Authorities have identified the gunman as Jaylen Fryberg. Fryberg’s Facebook page shows him living in Tulalip Bay, nine miles from Marysville-Pilchuck High School where police say two students were killed — including the gunman — and at least four others injured in the Friday morning tragedy. The Seattle Times reported that several students told them that Fryberg, a freshman, was responsible. Kobe Baumann, 14, told the paper that he was with Fryberg in English class shortly before the shooting, and that he appeared to be kind of nervous. Posts to Fryberg’s social media accounts convey his passion for sports, music, hunting, Native American interests and family activities. The teen's family is well known among the area's Tulalip Indian tribe. Tribe Chairman Herman Williams Sr. said his community is reeling from the tragedy and will be trying to cope for many days ahead. “Sadly, we are now experiencing what has become a national trend, which we, as a society, must address,” Williams said in a written statement. Many of Fryberg's social posts in the last year are pictures of him with the same girl, often commenting about his crush. He was clearly still smitten at the beginning of the summer, but somewhere along the way his messages took a sour turn. Jarron Webb, 15, confirmed to the Seattle Times that the shooter was angry at a girl who would not date him. Some of Fryberg's tweets over the last few months appear to be threatening, but it is unknown who he may have been targeting. He sent his final tweet on Thursday. Social media was also the home for sadness and shock in the hours after the shooting.